NaNoWriMo Day 10: Catching up! I’ve been putting this off for quite some time. At first, I was ashamed of my low word count after seeing many high word counts, but then I thought, hey maybe I can catch up in three days so I won’t be so embarrassed when i reveal my word count. Yep. I am one of those chickens. I told you all on day one, that I take challenges head-on and never give up. While that is true, I failed to mention that I also don’t like to lose. Ever. I don’t like being behind. But who does? I also know that since I am a first-time participant, there were bound to be some slow days. I am not in the habit off writing 1,667 words per day on basically the same topic. I have no idea what I am doing or writing half the time. I got sick over the weekend and am still sick. Yesterday I wrote just over 4,000 words between 11 pm on day 8 and 12 pm on day 9 before this disease that my husband brought home knocked me out. I slept off and on for almost 24 hours. I woke up today at 1 pm, determined to beat this cold write as if my life depended on it. I was going to write 5,000 words today. As you can see, it didn’t happen. I consider myself lucky to have written 3,417 decent words today. My characters made some revelations to me, I found a mystery man, and a surprise that I would never have thought of without the delirium of a cold and possibly a slight overdose of DayQuil. Hemingway’s penchant for writing while drunk are making sense to me now. So there it is. Out of the closet, and exposed for all to see–my sad stats. I didn’t write at all for two days and barely wrote 400 words on Friday. I know that I can still catch up, but at this rate it looks like I will be writing on both my anniversary and on thanksgiving day. But, I am still hoping to get ahead this week even if it brings me to the brink of death. If I get to that point, then I’ll stop. 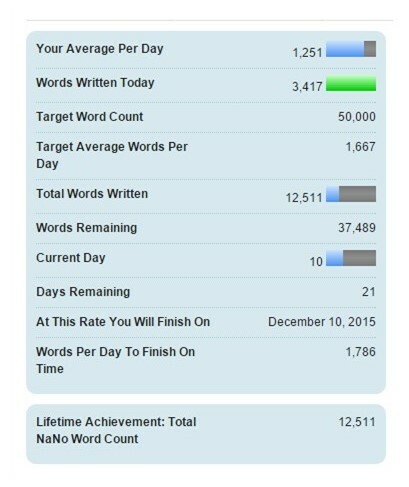 Next > NaNoWriMo Day 13: Almost Caught up! 3417 words is quite a lot for one day!! Good for you!! I have so much catching up to do it’s shameful~I’ll try and take a page out of your book (heheheheh) and catch up! You can do it! Determination to cross the finish line and a fantastic community of writers will get you there. I’ve been doing the word sprints on twitter and it helps a lot! Follow @NoNoWordSprints. 3417 words is a great number! I’m happy when I write anything over 2000 on a normal day. I’ve never gotten sick during NaNo, but I’d imagine that if I did, I wouldn’t be able to keep going until I felt better. I have a hard time writing when I’m really tired, so I don’t know how I could write when I’m sick. Good job on working through it! Thank you for the encouragement! Just woke up feeling slightly worse than yesterday, so today is going to be yet another tough push. I will be happy if I can come even close to yesterday’s 3417. I may just be happy with 2000.